Hello, I am the Rev. Edward G. Palmer. I spent several weeks looking for and researching alternative cancer cures after my wife Jackie was diagnosed with pancreatic cancer. The doctors told us there was no hope and to basically get her affairs in order while we had the time. I read thousands of pages on alternative cancer cures and distilled them down to "30 Cancer Killing Protocols." 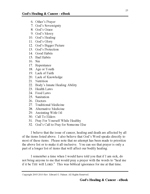 My eBook titled "God's Healing And Cancer" reveals these alternative cancer cures to you in detail. This eBook provides you with a very powerful guide that will help your body or a loved one's body heal itself and get rid of the cancer, but time is of the essence and precious. In addition to disclosing "30 Cancer Killing Protocols," my life saving eBook also discusses the end of life spiritual issues common in all life threatening illnesses. And, this eBook offers the perspective of God's Holy Word, which you can read and see with your own eyes, in direct contrast to the unbiblical doctrines often espoused by religious organizations as being God's Word on healing. You will find the spiritual answers you need in this eBook to life's toughest questions on healing and death. 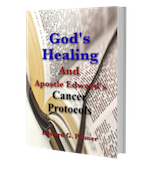 While the eBook is focused on cancer, the spiritual issues discussed apply to virtually any disease a person is dying from. Will prayer always give us the healing we think we need on our earthly journey? The answer is no and I explain what God has to say about all of this in my eBook. YET, do not be mistaken, there is power in any sincere prayer of the heart direct to our God. 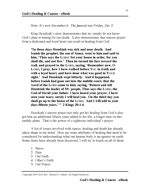 King Hezekiah's story in 2 Kings 20:1-6 fully illustrates the power of a righteous person's prayers. AND, yes -- God does heal some people as a direct result of their prayers. Find out what makes the difference to God in the nature of our prayers. In the case of Hezekiah's prayer to God, he was not only healed, but also promised by God that he would live 15 more years. Wow! It is not just prayer that you need to be concerned with. I have identified 32 factors that will affect your cancer and healing. If you don't take care of the items on this list, you are not doing your part. Therefore, you need to do everything in your power that might have a positive effect on your healing. For example, if you had lung cancer, you would quit smoking. Wouldn't you? If you continued to smoke cigarettes, what consequence would that have on your prayers to God? Yes, God expects us to do OUR part. There is no point praying to God for healing if we continue to refuse to eliminate causation factors of our own making. So, besides the "30 Cancer Killing Protocols," I also provide you with a list and discussion of 32 factors that can affect the outcome of your cancer and your efforts at natural healing. Synopsis: Uses organic flaxseed oil to reenergize cells and DNA with an abundance of free electrons thereby oxygenating the body and restoring your health on the cellular level. 1. Mix one (1) cup (or 8 oz) of organic cottage cheese containing only 1-2% fat with three (3) tablespoons of organic liquid flaxseed oil. 3. Obtain the flaxseed oil from the refrigerated section of the food store only to ensure freshness. 4. Mix in fresh fruit to make it more palatable. 5. Oxygenates body by supplying it with an abundance of free electrons, which are found in the flaxseed oil. 6. The organic cottage cheese makes the flaxseed oil water soluble so the body more easily absorbs the free electrons. 7. Developed in Europe by Dr. Johanna Budwig and used for over four decades as a diet cure for degenerative metabolic diseases such as cancer. 8. KEEP EATING the Budwig Diet until you are cured. 9. This is my second recommended cancer cure. Note: If you are a loved one is seriously sick, they may need help in preparing this mixture and may need to be spoon fed. You won't have to wonder about what action you need to take. I do not simply tell you, as in the case of the Budwig diet above, to take flaxseed oil mixed with organic cottage cheese. NO, I'm telling you in detail why it will benefit you and how to mix it together so you can put it to use in your own life. What good is a cancer cure if you don't know the dosage and how to use it? If you know someone who has cancer, give them the Budwig Diet instructions. The Budwig diet alone may cure them of their disease. What is the #1 strategy I would use? It involves eating the seeds of a common fruit. All of these cures are natural. None of them will poison your body like chemo therapy does nor will they burn your body like radiation therapy does. Dr. Johanna Budwig discovered her simple cancer cure over 40 years ago. Yet you won't hear about her cancer cure from the medical establishment intent on pushing drugs, chemo and surgery. Her cure has been blacklisted, but not anymore. You get the details in my eBook. Dr. Johanna Budwig took in patients who were literally minutes away from dying. People who could not even eat or drink or go to the bathroom. We are literally talking about the last minutes of a human life. THEN, she literally forced her simple solution down their throats and witnessed miraculous healing as their bodies were oxygenated and given the abundance of free electrons that were needed for healing at the cellular level. Dr. Johanna Budwig's diet is one simple CURE that can give you the hope you need and to stop the worrying you may be obsessed with. Her story is amazing. Yet, why are cures like hers being kept from us? The answer is simple. The cancer treatment industry is a multi-billion dollar industry. The cancer industry doesn't want you purchasing a $14.95 eBook and finding out how to deal inexpensively with cancer for yourself. Will you take action now to save the life of a loved one? How about yourself? Will you take personal responsibility for your own health and healing instead of transferring that responsibility to some doctor? My eBook will give you the information you need to fight cancer. You CAN do your part when you are informed! God Almighty has built into our bodies the innate ability to heal itself at the cellular level. Don't buy into a medical establishment statement that claims your DNA has been damaged and cannot be repaired. Even the DNA at the cellular level can be repaired if you give your body what it needs for restorative healing. However, time is of the essence in dealing with cancer. IF you have cancer, get this eBook NOW and start working on your God given body's innate ability to cure itself. IF you do not have cancer, get this eBook NOW and put an end to any further mental anguish, worry or even any concern about cancer. It should be worth $14.95 to end the cancer stress in your life or in a loved one's life. AND, you certainly don't have to stress out about buying this eBook. I firmly believe that this eBook will add value and peace into your life and that you will recognize its full value once you have it in your hands [or on your computer]. That is why I offer a 30-Day Money Back Guarantee. You can purchase your eBook risk free. If you are not 100% satisfied that the information contained in my eBook is worth every penny, simply fill out the refund request form and I will refund your money with no questions asked. Therefore, you can purchase this eBook RISK FREE. So, you don't have to fret about purchasing this eBook with my 30-Day Money Back Guarantee. And, you can also stop worrying about cancer once you get your own copy. Never lose another night's sleep worrying about cancer and wondering what you would do if you found yourself suddenly with cancer. Buy my Cancer eBook and you'll sleep sound knowing thirty healing strategies and thirty-two factors affecting healing, which can restore health back when used. Even better, by getting informed on these alternative healing strategies and what God has to say about our healing, you will have a heads-up in preventing cancer from occurring in the first place. Millions of people worry daily about hearing the dreaded "cancer" word. I don't. In fact, I haven't lost a moment's sleep thinking about "what if I got cancer." You'll find out why I am not concerned about cancer in this exciting spiritual and alternative healing cancer eBook. Take the #1 protocol as a cancer preventative. It is a simple fruit seed that you can eat daily and forget your worries about cancer. Yet, if you actually have cancer, the protocol in my eBook spells out exactly how you can use my preferred #1 cure to help stop the cancer dead in its tracks. You will find the "30 Cancer Killing Protocols" prioritized. If you could only implement a part of the protocols listed to kill the cancer that invades your body, you'll know where to start. The "Top 12 Cancer Killing Protocols" I would personally use to defy any cancer attack are clearly defined so you can put them to immediate use. Eighteen additional "Cancer Killing Protocols" are then defined to give you a total of 30 alternative health strategies known to effectively kill cancer cells. If death is knocking at your door, you will want to implement as many of these protocols as you can to kill the cancer cells. This is especially true if you are faced with a Stage IV advanced cancer, which is always difficult to stop. Take action today, as time is of the essence in healing. Do you have to believe in God to benefit from this eBook? No, you don't. Your body will benefit from the cancer killing protocols defined in this book regardless of your belief in God. This is a book that I wrote to address the gap in alternative knowledge about cancer. It is a cancer healing book. I do not attempt to convince you of any belief system in this book. So, you won't find a chapter in this eBook about why you should believe in my God or a sales pitch to sell you on Jesus. The information in this eBook will benefit every human on the planet regardless of their faith or belief in God. YET, simply from an intellectual curiosity point of view, wouldn't you like to know what the God of the Holy Bible has to say about healing our human body? The body that HE created? And, if you do have a deep faith in God, regardless of religion, you will benefit more because of the spiritual content disclosed in the book concerning healing. The section on dealing with stress is directly related to our internal peace, which is directly related to our trust in God's providential hand. In addition to the "30 Cancer Killing Protocols" and the "32 Factors Affecting Cancer," this eBook has several benefits over a regular printed book. Acrobat Reader 5.0 or greater is required to view and read this eBook. You can get your copy of Acrobat Reader free from Adobe at this link. When you get to Adobe.com, simply select Acrobat Reader. The software is free and is easy to download and get installed on any computer. Section III in my eBook provides you with an online cancer information resource developed as a supplement to this eBook resource. It has great resources which includes where to buy the fruit seeds I talk about in my #1 cancer killing protocol. And, where to buy all the nutrients specified in the Oasis of Hope Hospital cancer treatment protocol, which is also located at this site. A complete section of videos are available to explain the science behind the seeds in protocol #1 and how the seeds will effectively kill cancer cells. With this supplemental resource, your Cancer eBook will remain up to date for years to come. The reason for my passion to educate you about alternative cancer cures is simple. I have personal experience in using these cancer killing protocols. I know they work! God's Word says: "My people are destroyed for lack of knowledge." [Hosea 4:6] It breaks my heart to see needless cancer deaths, which are the direct result of a profound ignorance of the many alternative cancer cures that are available to us. I personally have had growths fall off my body as a result of using the number #1 cancer cure protocol in my eBook. I've used this protocol for several years now as a cancer preventative measure. My friends have had similar experiences with growths falling off of their bodies. There are tens of thousands of needless cancer deaths due to a "lack of knowledge" and to the insanity and the unwillingness of the medical establishment to fully inform our families about natural alternative cancer cures. Answer this question: "If a doctor sends someone home with a death sentence stating the medical system cannot do anything more for their cancer, EXACTLY WHAT difference does it make to the medical system for us to THEN become informed on alternative cancer cures?" Absolutely no difference! YET, often by the time the medical system gets done destroying a body with chemo, radiation and surgery — it is so bad off that it might actually take a miracle to restore health. If you want a cure for cancer, take personal responsibility for the restoration of your health and become proactive. When you get proactive, you get informed. You don't have to die of cancer because of a lack of knowledge or the fact that medical doctors will not inform you of alternative cures. Listen, there is a "built-in systemic reason" why the medical doctors can't and/or won't inform you. Any doctor who strays from "standard medical practices" WILL lose their license to practice medicine. Telling you about alternative cancer cures, either proven or unproven, is just cause for losing their license to practice medicine. And, yes, even if they have sent you home with a death sentence telling you they cannot do anything for you! That is why you will never hear about alternative cancer cures from any M.D. And, puhleeeese, be very wary of "experimental" medical programs AFTER they have already sentenced you to death with cancer. Don't give up your remaining good time letting the establishment kill or destroy even more of your body's cells. Do something proactive that can actually give your body an opportunity to restore itself to health. I can't prevent a doctor from sending you or a loved one home to die of cancer, but I can inform you that their cancer diagnosis doesn't have to result in death. There are options other than those provided by the medical industry. Do yourself and a loved one a favor and get educated about the alternative cancer cures in my Cancer eBook. Buy the eBook risk-free right NOW! You will never regret the decision to spend $14.95. 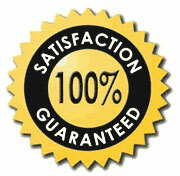 And, if you are not 100% satisfied within 30-days, your money will be promptly refunded. Simply fill out the refund request form. God speaks to the prophet Hosea and tells him that the priests are not doing their job educating people about God HIMSELF. As a result, HIS people's souls are destroyed. AND YET, this word from God is not just about knowing HIM. It is also about knowing the fundamental things about human life such as what foods are good for you and what foods are bad for you. It is not only possessing the knowledge, but believing that knowledge inside of your heart to the point you will exert the will power to change your life's environment. That means it is not good enough that you have the knowledge smoking is bad for your body [if you smoke]; but, you must also believe in your heart enough to actually take action that can alter the outcome. In this case, you would stop smoking. The same thing applies with cancer information. What you don't know CAN actually kill you. Therefore, ignorance is not bliss as so many mistakenly believe. What you don't believe CAN also actually kill you. So get informed; get proactive; and, take responsibility for your own health. God has directed me to make this Cancer eBook available to save lives. However, only you can make the decision to get informed before it is too late. Time is of the essence in dealing with cancer. That means you need to get informed and involved in your health decision BEFORE the medical establishment destroys your body's cells and eliminates any chance to restore health. Use the prayer request form to add you or your loved one's name to my ministry's prayer list. You can also use this form to contact us concerning any eBook questions you may have. Need a way to get some hope back? This eBook is where you'll find it! Take action today. Time is of the essence in fighting cancer. BUY Risk free. 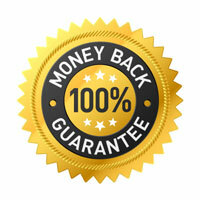 We provide a 100% Money Back Guarantee for 30-Days on all books and eBook downloads. Printed books must be returned in resalable condition and shipping costs are not refunded.